As it’s the start of a new week, let’s begin with the euro dollar weekly chart and see what conclusions we can draw from looking at a longer time frame, and remember to use the long timescales for your direction, and the shorter time frames for your entry and exit points. In virtually all our trading we are either looking for confirmation signals of a move, or alternatively we are looking for turning points which may be signaling a change in direction. Note the doji candle in the last week in November, which was the first signal that the move may have ended, and was subsequently followed by a series of doji’s, along with an inverted hammer, before prices moved upwards. Another classic candle for this is referred to as the shooting star ( sometimes referred to as an upthrust ) and one of these is seen in the last week in December which follows an evening doji star candle in the previous week, which is another classic signal for a turning point. The evening star describes it exactly as though an evening star in the sky. Following these two signals we have four subsequent weeks of down candles, which subsequently cross the 9 and 14 moving averages. An interesting point to note is that last week’s candle did not open lower than the previous week – in general for a trend to be confirmed one always looks for higher highs and higher lows and higher closes in an up move, and lower highs and lower lows and lower closes in a down move. So here we have an anomaly which could be a signal that the move is perhaps coming to an end, but we need to wait for next week’s candle to see what the candle will tell us for the longer term. Remember that it is Chinese New Year so the markets are virtually closed all week! Now let’s look at the daily chart. As I suggested on Friday, we saw the euro dollar fall in morning trading, only to rally in the afternoon on the back of a bounce in stocks, oil prices, and commodities (in particular spot gold prices ). This left us with a hammer, testing support at the 1.2900 level once again. With prices moving sideways in the 1.29 region, and with more bad news about the banks within Euroland, this is doing the Euro no favors at the moment. I am expecting more of the same this morning, although it is interesting to note that prices have opened “gapped down” at the open on the daily chart, which is often a signal to a confirming move. 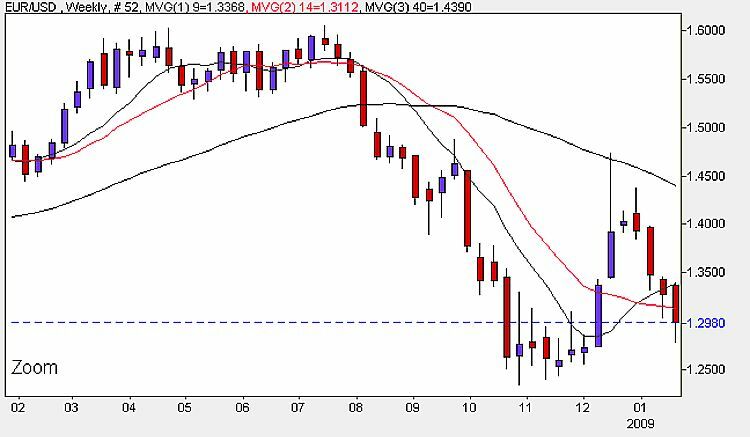 The 9 day and 14 day moving averages remain in a downward trend with the 40 day moving average also turning lower. To be confident of any significant move in the euro dollar price, we need to wait for a confirming signal in the daily charts. 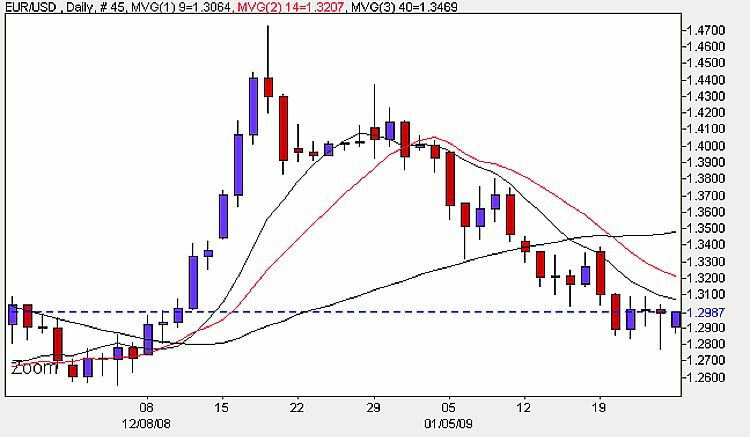 If prices break through the current support level at 1.2940, then we can expect a move lower, provided this is supported by confirming candles. The only major fundamental news we have out later this afternoon is the Existing Home Sales due at 15.00 in the US. I will comment on this on the euro to dollar fundamental site as the news is released. My suggestions for today’s intraday trades are attempt small long positions. The short term outlook is sideways, medium term and long term are bearish.